One daily capsule delivers the benefits of 25 cups of Green Tea. Made Naturally using Live Green Tea. 24 hour Active Anti-Oxidant Protection. Vanessa de Ascencao, nutritionist, author, speaker, educator and passionate about treating our bodies with love, respect and kindness. The major benefits of green tea stem from its rich supply of catechins, of which eight types are found in green tea. The major health promoting , anti-aging , disease fighting and vitality boosting benefits of Green Tea stem from its rich supply of Catechin. Thousands of published studies have verified the benefits these powerful Catechins have the potential to deliver and the evidence continues to mount daily. In order to obtain the real benefits we need high enough levels of catechins in the blood stream, not some times , but all the time, daily. This means drinking large amounts of good quality Green Tea , all day , every day or using a supplement proven to deliver catechin into the blood stream effectively and not all supplements are created equal! 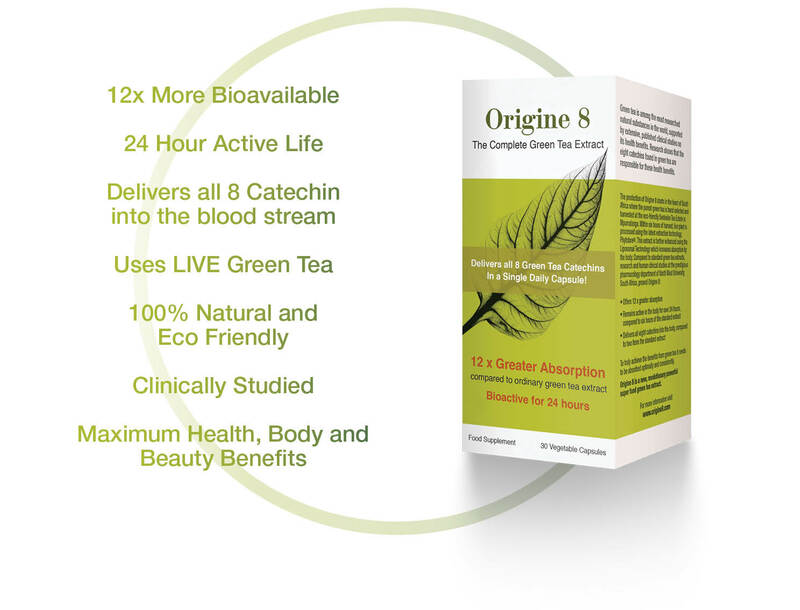 Origine 8 – Proven all day Catechin activity in a simple one a day capsule! What makes Origine 8 so special? When I started taking Origine 8 I was suffering with post nasal drip as a result of allergies. I was also fatigued and had been experiencing a sore throat for a few weeks which wouldn’t go away. I tried everything to feel better but nothing worked. After a few days of taking a single daily capsule of Origine 8, I felt energized and no longer suffered from a sore throat. My nasal drip has also subsided. I can feel the difference already, wow! It has now been 6 weeks since I started taking this incredible supplement and the results are beyond amazing! I am no longer tired, filled with energy, sleep like a baby and no longer plagued with constant sugar cravings. As an added bonus, i have also lost weight. I highly recommend this supplement and will continue taking it on a daily basis. © 2016 Origine 8. All Rights Reserved.